Burning Man, the annual festival in Nevada’s Black Rock Desert, features a slew of wild and elaborate art installations. Sticking to Burning Man’s tradition of returning the desert to its original state, many of the art pieces are burned at the end of the festival. Some of them, however, are transported elsewhere after their time in Black Rock City. The festival began more than 30 years ago as a bonfire among friends on a beach in San Francisco; as it has evolved, its art installations have become increasingly more elaborate, with some costing hundreds of thousands of dollars to build. We’ve looked back through the years at some of the priciest installations. A caveat: Several artists would not disclose how much money they spent on their installations, adding that some of the funds were covered by anonymous donors. Many installations, however, collected large sums of money through crowdfunding campaigns. We took those campaigns – as well as how much money they ultimately raised – into account. The Temple of Whollyness was built in 2013 after a $US65,000 fundraising campaign. Since 2000, a new temple has been created each year for Burning Man. In 2013, the tradition continued when a group of artists named The Collection Crew launched a $US65,000 Kickstarter campaign to help fund construction costs. The artists surpassed their goal by more than $US11,000. A 64-foot-tall pyramid was located in the center of the temple, built only out of interlocking pieces of wood. According to The Collection Crew’s fundraising page, the design did not require any nails, glue, or metal fasteners. A massive sculpture of two human figures had a $US265,000 budget. Embrace, a sculpture of two human figures, stood 72 feet tall at Burning Man 2014. A $US47,000 Kickstarter campaign helped fund the project, which was estimated to cost about $US265,000 total. More than 160,000 pounds of wood were used to construct Embrace, and festival attendees could make their way through its interior on spiral staircases. R-Evolution was the final sculpture in artist Marco Cochrane’s three-part Bliss Project. Artist Marco Cochrane finished his Bliss Project in 2015 with R-Evolution, a 45-foot sculpture that cost hundreds of thousands of dollars. 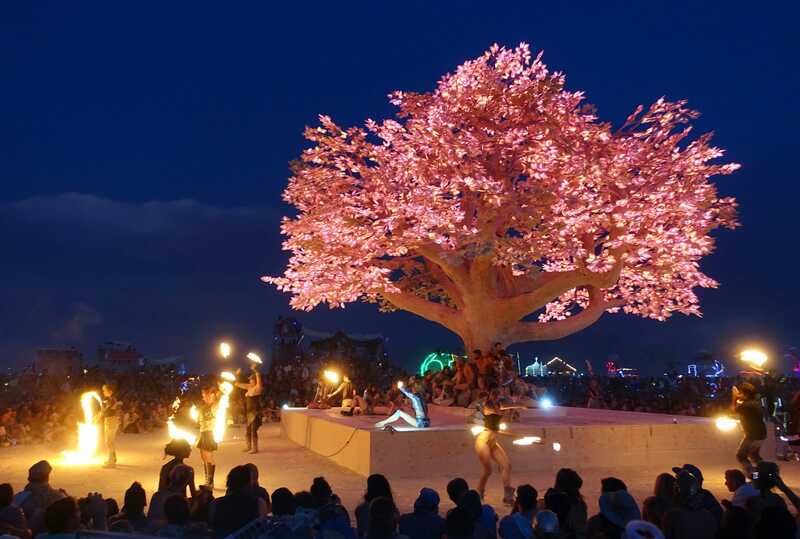 An Indiegogo campaign raised $US40,845 for the project, which followed the first two installations in this Burning Man series: Bliss Dance and Truth is Beauty. On his website, Cochrane wrote that Bliss Project sculptures are meant to de-objectify women and inspire people to take action toward ending violence against women. David Best, who designed the first Burning Man temple, returned to the festival in 2014. 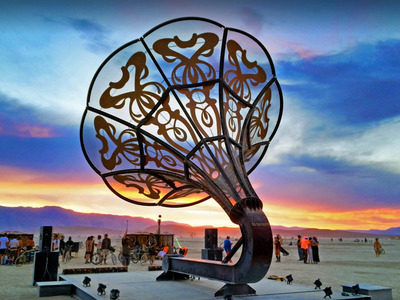 Sculptor David Best started the tradition of building a temple in Black Rock City each year, and he returned to Burning Man in 2014 with another design. Best’s team sought $US40,000 in donations through a Kickstarter campaign and raised nearly $US52,000 by the end. The Temple of Grace was created as a space for reflection and was set in a courtyard with surrounding walls. 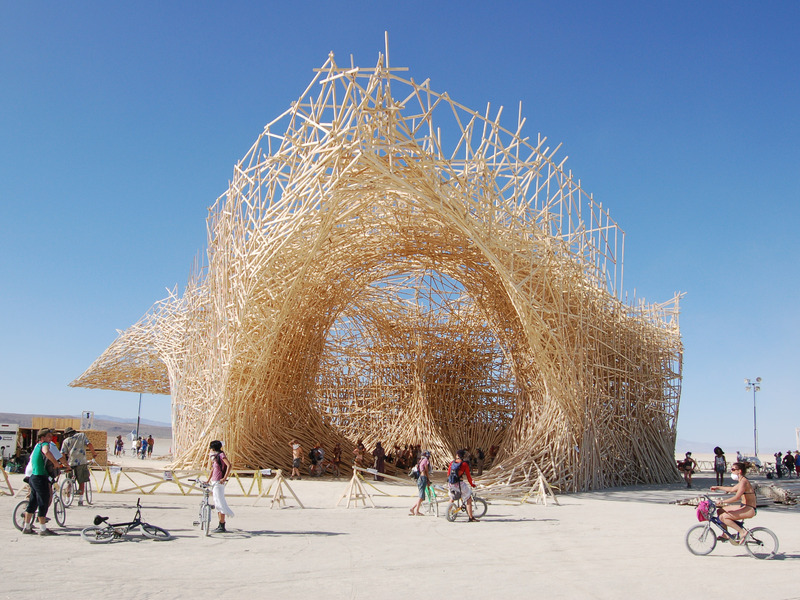 Best has designed roughly half of the Burning Man temples since 2000. Best returned to Burning Man once again in 2016 with his final temple design. David Best came back once more to Burning Man in 2016 with yet another temple. This time, he raised $US66,000 for the structure through a Kickstarter campaign. According to the Reno Gazette-Journal, Best sees the temples as a place of loss and healing. He has built many of them in places of current and former conflict, such as Nepal and Northern Ireland. These temples are meant to help people let go; the walls are often covered in messages, photos, and other items people use to remember their loved ones. 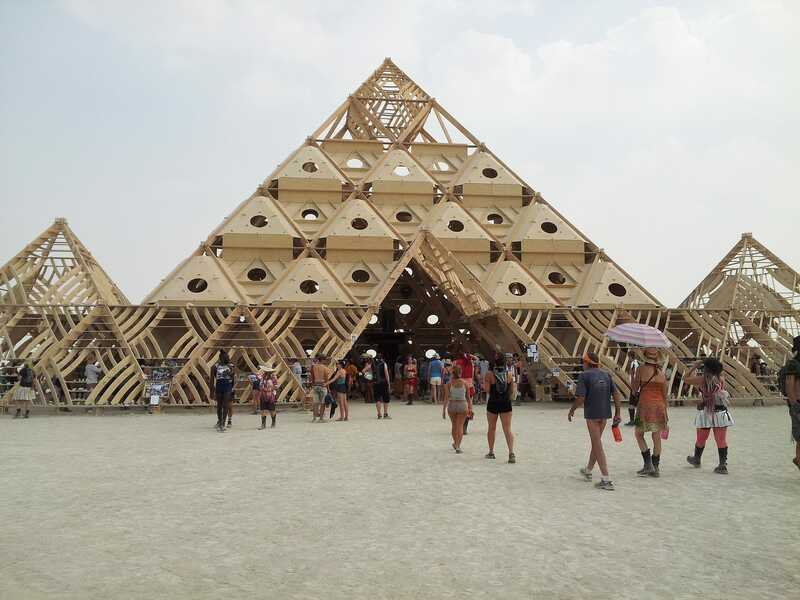 Best told the Reno Gazette-Journal that he won’t design more Burning Man temples after 2016. In 2006, a group of Belgian artists created a massive installation that is rumoured to have cost up to $US800,000. Featured at Burning Man 2006, the Uchronia installation was made up of about 93 miles of wooden slates. An additional 93 miles of slates were donated to build more housing for victims of Hurricane Katrina. The project was led by Belgian artist Arne Quinze, and a group of about 40 people spent three weeks working on the installation in the desert. Uchronia is rumoured to have cost up to $US800,000 to create, and it was burned at the end of the festival. 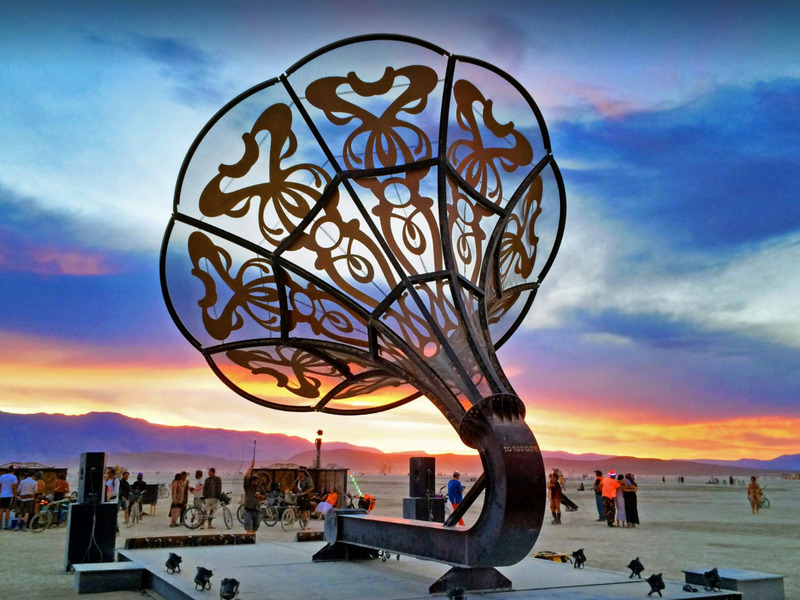 In 2017, Burning Man featured a 35-foot-tall steel gramophone. La Victrola, a five-ton steel gramophone, played numerous records and served as a cabaret stage during Burning Man last year. The 35-foot gramophone – reminding attendees of vaudeville, jazz, and speakeasies – sat on top of a nine-foot box with a railing and staircases. 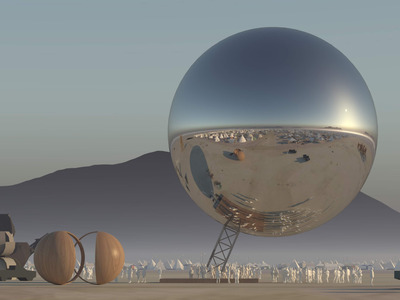 To help bring the structure to Black Rock City, the organisers launched a $US40,000 Indiegogo campaign, which ultimately brought $US23,000 to the team. A $US60,000 Indiegogo campaign helped fund last year’s Tree of Ténéré. The Tree of Ténéré, which debuted during Burning Man in 2017, can hold 60 people on its branches. All of the leaves on the four-story-tall tree are covered in LED lights, producing a variety of colours and patterns in the evening. Software connected to the canopy allows other artists to prepare light patterns for display on the tree. The installation’s name comes from a region in the Sahara desert, where a tree is said to have grown in complete isolation, with nothing else in a 250-mile radius. An Indiegogo campaign, launched by San Francisco-based artist Zachary Smith, raised more than $US35,000 of Smith’s $US60,000 goal. 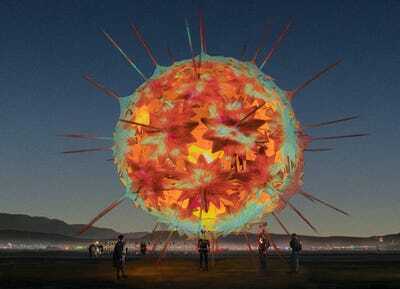 Danish architect Bjarke Ingels is raising $US50,000 to bring a giant orb to Burning Man. Danish architects Bjarke Ingels and Jakob Lange have raised nearly $US24,000 through an Indiegogo campaign to bring a giant orb to this year’s Burning Man. The Orb reflects its surroundings like a mirror, and it is scaled to 1/500,000 of the Earth’s size. The installation, which is nearly 100 feet in diameter, is designed to help festival attendees navigate Black Rock City. Ingels’ team has shipped parts of the Orb to Nevada in five different containers, and the installation has been designed to deflate easily once the festival comes to a close. A five-story sphere of origami shells will also debut at this year’s Burning Man. Continuing its tradition of creating nature-inspired sculptures, the FoldHaus Art Collective is raising money to bring a five-story sphere of origami shells to this year’s Burning Man. RadiaLumia appears to be inspired by Radiolaria, tiny organisms that once covered the sea floor in the Black Rock area, according to the collective’s fundraising page. Festival attendees will be able to step inside RadiaLumia to climb a platform and look at the surrounding area. The Kickstarter campaign has raised more than $US35,000, but FoldHaus organisers told Business Insider that the fundraiser only covers a small part of the cost. They would not disclose how expensive RadiaLumia is.